This article is for those windows users who have recently upgraded to windows 10 from windows 8 / 7. When you have upgraded to windows 10 , windows have created a folder named windows.old in your PC in which old operating system installation files lies. These files are kept in your system in order to provide you a chance of reverting back to the old operating system. Now, this chance is there for users for only 30 days. So, if you have made up your mind to stick with windows 10, then its a better decision to delete that folder and reclaim around 18 GB of free space. Step 1 – Search Disk Cleanup in the search box of your windows 10 taskbar. Click on Disk Cleanup from the search result. 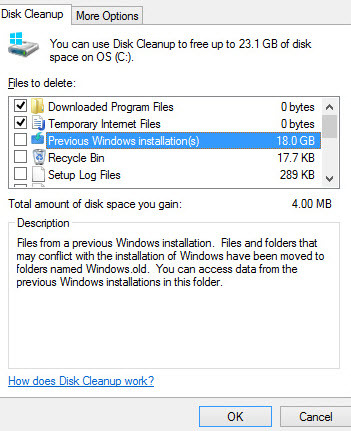 Step 2 – On clicking it disk cleanup info box will pop up. 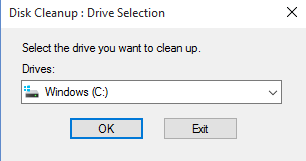 In this your drive which is having your windows installed will show up. The light blue colored flag shows the installation drive. For few seconds it will search for how much space is recoverable. Step 3 – Now, select on windows.old folder from the list having maximum size in GB. Press ok and the windows.old will be removed from your system.